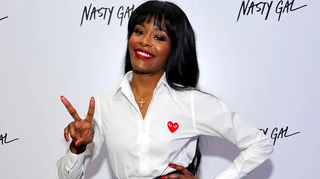 Azealia Banks was briefly sorry for destroying Grimes and Elon Musk’s domestic bliss over the summer, but...that’s over! Now she’s shared some very rude texts allegedly exchanged between her and Grimes, posting them on Instagram for all the world to see. Now we know that you do NOT want to tangle with Banks in a text fight, because she will crush you. Last week, a judge ordered Grimes and Banks to preserve their correspondence as part of the lawsuit by several Tesla investors against Musk, who thought it would be hi-laaarious to tweet that he intended to take his company private at $420 a share. Turns out there was quite a bit of back and forth between the two, and it was bitchy. Banks deleted the posts, but they will live on forever in reddit. Note that these were sent after 4 a.m., so I’m sure everyone was nice and sober.